The Korean ACAP Regional Qualifiers happened on 4&6 July. Teams "Hey" and "Ttukbaegi breaker" will be advancing to the APAC Regional Championship. Today we will discuss, the Contest submissions! Congratulations to Alisaunder and Suchghost! 3 Control points, 1 active at a time that spawn, Hold the point Ragnaros will fight for you if you fill the bar up to 100% for 10 seconds. Instead healing debuff, lava fills the arena slowly over time. Deals damage. Increases over time. Winning Rewards: Coloured reskin of a T1 piece, over 5 NEW colours, never before seen in game. I agree! I would like to see more storyline in my PvP options, like the continuation of the arrival at Stormheim, with two gun ships sailing through the clouds with Genn or some other high ranking Alliance and Horde leader giving us a speech while we wait to start and test out the cannons a bit. The clouds part! Grapples get thrown! Cannons roar! People are swinging, grappling or jump packing across to the enemy ships, defending their own ships to a last man standing finish. Or NPC rezzers in the bowels of the ship revive the dead and it's on to kill Genn if you can. Winners (or survivors) can receive a cut scene receiving a medal and some kind of achievement. Maybe an honorary title or some other RP perk like become an honorary member of the Gilnean forces. I've got a suggestion for a PVP battleground that would be Legion themed. I don't think Blizz has made enough use of those cool flying Legion disks on the Broken Shore yet. I think it would be really cool to have a sort of "capture the node via flying" sort of battleground. You could have the Sentinax as the main mid point, and maybe two other Legion ships as secondary points kind of like in Eye of the Storm. But in order to get to them, you need the flying disks, and you could gain a special ability and have combat on the disks. Plus, wouldn't it be cool to get an achievement for knocking another playing off said disk :D.
You would also have basic combat and buffs on the "ground" of the island as well, but the main thing would be surviving flying to the ship and successfully capturing it for your side. 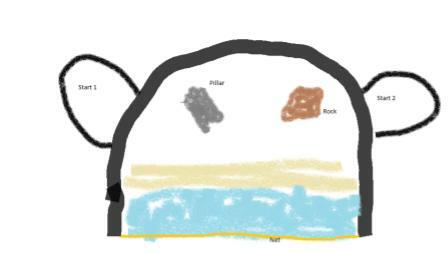 The idea is there and hopefully from the picture you can see the map layout. Again, the layout is also very simple and not fleshed out at all. Just enough time to make the basic layout at its core. The map itself is 100% fair on either team because it is completely symmetrical. There is a bottom floor and ramps that leads to an upper floor. Very similar to Blades Edge Arena but less complicated. Blades edge is a cool map because of the dynamics that are involved with the different floor levels. However that map is kind of complicated in nature as it has 6 ramps leading to the upper level and a bunch of line of site location down below. 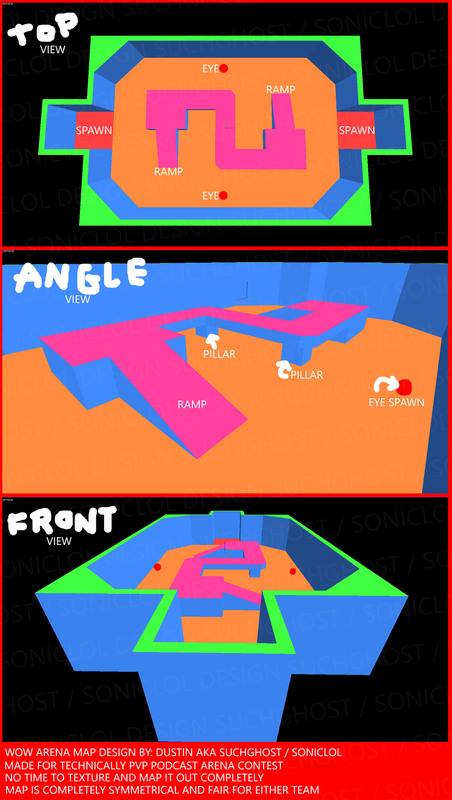 My new design render has only 2 ramps up and a couple line of site locations down below. Which would be great in my opinion. The theme for the map can be literally anything but I think a cool dark rocky texture with bright green lava and fire would fit a demon/legion theme. Call this map "Demon's Stand" or something cheesy like that. Would be located somewhere in the new demon hunter zone. Can be added to the normal PvP arena queue. Arena design: Open concept with areas that have LOS like. Inside the arena there are random pop up boost icons. Red boost will stun you as well and make you immune to damage. This allows the other person to heal and move while possibly gaining an advantage. Yellow boost will slow you down while increasing your damage output. Green boost will increase your speed while increasing the damage you take from other players. You take the negative with the positive or you can maneuver your opponents to gain the boost. Black rook hold, Nagrand, Shadopan arena and the big open desert arena platforms would be good for this boost system. This arena is set in Naga lore. It is on the shore of zone (to be determined), in old elf ruins. The top of the walls will be filled with Naga watching their prisoners fight to their deaths, with Lady Vash occasionally watching (she will do taunts like the Ogre King in Nagrand Arena). The dead are used to feed the Kraken. If players stay after the match ends, Kraken tentacles will pull the bodies of the dead out to sea. My arena is set in Suramar City. Both teams have a long bridge they will be battling on amidst a legion assault on the city. The bridge is placed at height, adorned with ancient mana and mystical foliage, and is the access point to the inner sanctum of Suramar City a crucial edge for the legion and in that same vein an almost fatal blow to Suramar. A unique tactic will be available to the contestants consisting of tightly packed groups or “surimarian” forces and legion forces that will move. Essentially these function as moving pillars for LoS which requires more than a rinse and repeat tactic and mixes a little strategy and RNG into the mix. Additionally it should give the feel that you are not the only ones doing battle and that you really are fighting alongside the armies as legion forces will take out the forces of suramar and vice-versa as time goes on. My first arena is totally a troll with the long hallway and portals on each side so that as a frost mage i can kite you forever but that is not a very fair arena for a lot of reason so my realistic arena would be based in the great dark beyond think star auger fight in night hold the first stage outer space the map will last five mins and have a ton of line of sight and places to hide from your opponents after that there will be an announcement and the zone will planer shift meteors will smash the outer edge of the platform which you can fall off of to your death now you will be in a fel style zone there will be far less places to hide but still some that can be used if the match last 10 min then once again an announcement will be made and a giant demon will smash his fist into the center of the arena there is now no longer any place to hide it is a open area no pillars no los and the arena in the twisting nether think eye of the storm style now has walls there is no escape and the match should finish quickly but if the match continues to the 15 min mark an old god will appear and kill everyone and it's a draw. Congratulations to Alisaunder, who answered: Azeroth has two moons and an Argus; Which is still less than Jupiter has.